I have no idea what a lottery ticket would look like in the 18th century. Perhaps it was a token with a number on it or even a ball with its twi to go into the hat. I was prompted by these thoughts on learning today that Browne Willis, Squire of Whaddon Hall, antiquarian, MP and general benefactor to the community used a lottery to raise funds for the rebuilding of St Mary Magdelen in Stony Stratford. As many of you know, the great fire of 1742 destroyed much of the east side of the town and with it the church of St Mary Magdelen, which had been standing since about 1290. Almost nothing but the stone shell of the building survived the blaze and with the more pressing issue of rebuilding much of the town, the church became a secondary priority. The church was in effect abandoned and the stones reused in various walls and building projects around Stony Stratford. However the tower was saved and it still stands today. This not altogether clear how this might work. Possibly Browne Willis offered the single ticket and people bought their stake in the lottery. By some process, perhaps putting balls into a hat with, let us say, 100 black balls and one red one, the hat was passed round until the lucky one drew the red ball. He was then given the ticket to be redeemed for the un-named prize. Curious, but no doubt effective. 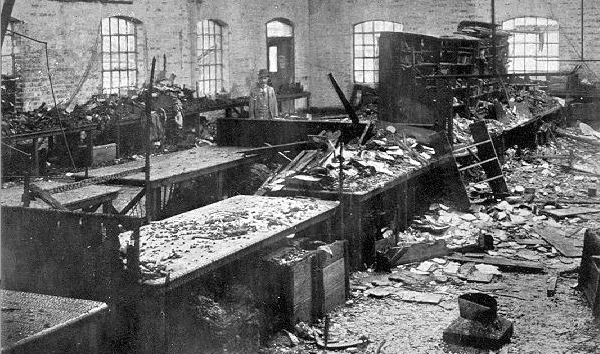 These were the scenes the day after the fire – September 21st 1906. I do not know the cause of the fire, but it left Wolverton without a covered market for a while. The Market House was built in 1842, just the west of the original railway line (now McConnell Drive) and south of the Stratford Road. The shell of the building survived, so it was rebuilt and it served (and continues to serve) various functions since that date. As it turned out, the old school on Creed Street had just been vacated by the girls and infants to move into their new school on Aylesbury Street, and the market traders were able to move into the old school building. And there the Friday market remained until July 1979, when it transferred to the newly-built and controversial Agora. My personal view is that it lost a great deal of its natural vibrancy in that move. The Friday Market used to be a big weekly occasion and for the morning and part of the afternoon the area thronged with thousands of customers, from both Wolverton and all the outlying towns and villages. Extra buses and trains were laid on for the occasion. Now I know times change, but I still see weekly markets thriving where the deadening hand of bureaucracy has been withheld. About 15 years ago, when I lived in the country, I had a neighbour (that is: in the next field) who had a house with a thatched roof. It was a large, comfortable, modernized house but either he or the previous owner had decided a decade earlier to give the house a thatched roof. Thatched roofs, which were once a cheap roof covering, have now become an expensive status symbols. Sad to report, we were wakenend one night by a blaze as the roof caught fire. Fire engines converged from several parts of Hampshire and it took them the rest of the night to quench the fire. Fortunately nobody was injured but the house was ruined. One lesson my neighbour learned from this was that he was never going to live under a thatched roof again. Needless to add, the planning authorities did everything in their power to try to get him to replace the thatch, but my neighbour was a man of means and the bureaucrats were no match for him. This preamble is by way of introduction to the great 18th century fires at Stony Stratford. Most roofs, even on substantial buildings were thatched, and therefore vulnerable. In 1736 an accidental fire brought the loss of 53 houses. The precise location is not known. Six years later there was a much bigger fire and we have a reported account from the Northampton Mercury of May 1st 1742. The fire originated at The Bull Inn with a servant girl who was drying sheets before the fire place. One of them caught fire and instead of smothering it she panicked and stuffed the sheet up the chimney, hoping not to be found out by her mistress. This action compounded her problems. the chimney caught fire and then the roof. There was also a high wind and the fire leapt from one building to another, not simply on the one side of the High Street, but also crossing the street, hitting a thatched roof on the other side and relentlessly catching other houses in its destructive path. The fire also destroyed the church of St Mary Magdalene, built about 1280. It was never rebuilt. 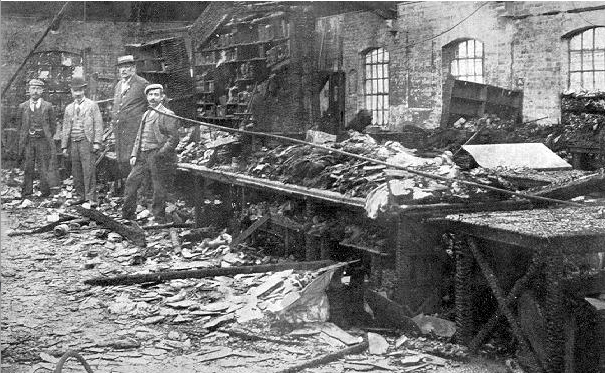 The paper also reported that the fire crossed the River Ouse and burned houses in Old Stratford. 146 buildings were destroyed and the majority of Medieval Stony Stratford with it. If you take a look at Stony Stratford High Street today you can find surviving Medieval buildings to the south of the Bull but little to the north, with the exception of the Fox and Hounds (formerly The Lyon).